Seven embroidered mens everday cotton handkerchiefs. Seven embroidered mens everday cotton handkerchiefs. 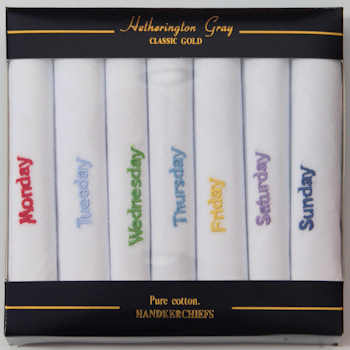 Every man should have a cotton handkerchief in his pocket, this daily set is a great way to organise a weeks supply. With this set you will receive 7 everyday white 100% cotton standard mens handkerchiefs each embroidered the days fo the week in a different colour thread. Seven embroidered mens everday cotton handkerchiefs. Every man should have a cotton handkerchief in his pocket, this daily set is a great way to organise a weeks supply. With this set you will receive 7 everyday white 100% cotton standard mens handkerchiefs each embroidered the days fo the week in a different colour thread. Supplied in an attractive card presentation box with clear window.